Twenty-nine-year-old Australian embroidery artist Meredith Woolnough lives just two steps away from the South Pacific Ocean. Her home and studio are near the beach in Newcastle, New South Wales, some 150 kilometres north of Sydney. New South Wales was the first part of Australia to be settled, which has earned it the nickname The First State. Its motto is Orta Recens Quam Pura Nites (Newly Risen, How Brightly You Shine). Now if anyone in Australia or in the embroidery world shines brightly it is Meredith Woolnough, whose art works emanate an incredible beauty. 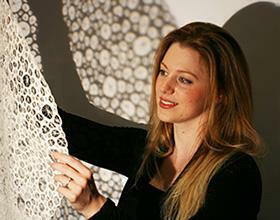 Meredith Woolnough feels greatly inspired by the ocean and underwater life. She and her husband love snorkelling and are fanatical scuba divers. "When I am sewing, I am building a structure"
During her underwater voyages of discovery Meredith uses an underwater camera to take photographs of coral reefs and the multifarious creatures that live in their interstices. Meredith uses these pictures as inspiration for her embroidered art, which often seeks to mimic nature. "I live 500 metres from the ocean," she explains. "I can walk to a lovely beach in a few minutes and I snorkel and scubadive when I can. The inspiration for my work comes from the structures and patterns in leaves, coral and shells. I am fascinated by structures and the way things grow and I attempt to replicate these structures in my embroidery. The photos I take serve as reference material that inspires me and influences my designs. The underwater scenery near my home is really amazing, but my favourite place to dive within Australia is the Great Barrier Reef." The Great Barrier Reef is the world's largest coral reef system, composed of over 2,900 individual reefs and 900 islands stretching for over 2,300 kilometres. It is located in the Coral Sea off the coast of Queensland, Australia. Meredith: "The Great Barrier Reef is where I first learned to scuba dive and that is really where I fell in love with coral reefs." The Great Barrier Reef, like many other natural structures, is vulnerable to climate change. Initial estimates show that the 1911 Cyclone Yasi caused severe damage to parts of the reef, where severe gusts of wind broke off pieces of coral. 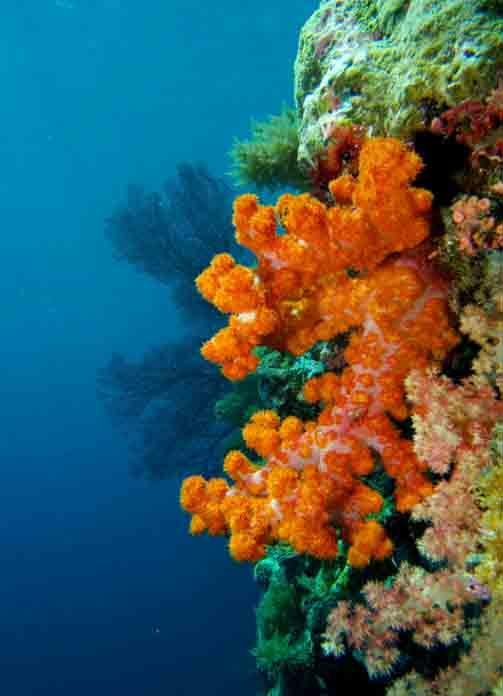 Meredith is worried about the impact of the various environmental threats to the Great Barrier Reef, one of the natural wonders of her country. "Global warming is causing the coral to grow more slowly, and the coral is starting to bleach or die in some areas. Fortunately, the reef has considerable powers of regeneration, but it is definitely getting smaller. Some people are concerned that it will disappear completely in the long run. My work is not generally considered to be 'environmental art', but I am certainly conscious of the dangers to our coral reefs and I hope that through my artwork people will develop an appreciation for the beauty and fragility of our oceans and reefs." 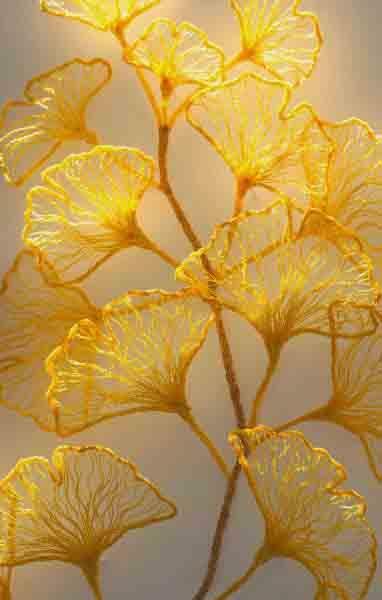 Ginkgo Study #1 - embroidery thread, pins, glass rods on Fabriano paper. The Ginkgo leaf is a popular motif in Japanese art. 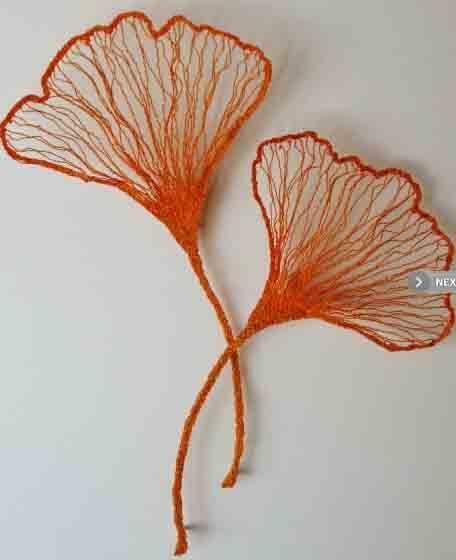 Meredith uses freehand machine embroidery to create sculptural art works inspired by natural forms such as Ginkgo leaves or coral reefs. 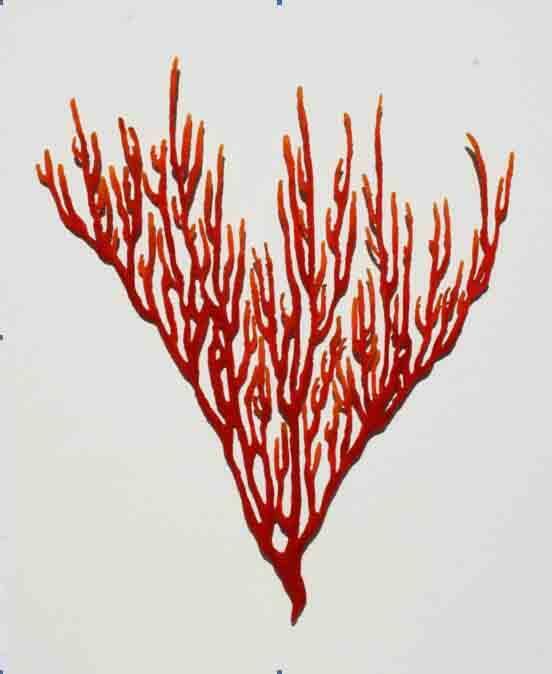 Some of her stitched creations can look very lifelike and some people have believed them to be real coral branches when they first saw them. It is only upon closer inspection that people realize that they are in fact detailed embroidered sculptures. How close can elaborate, refined art works get to nature? 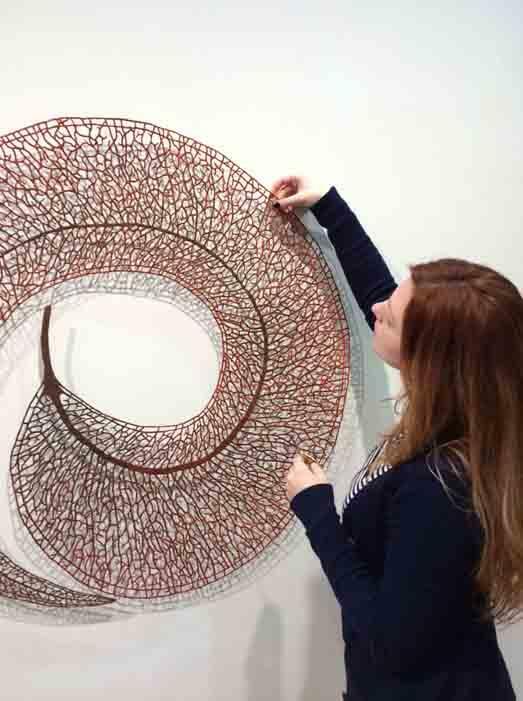 While studying for her Bachelor's degree in Fine Arts from the University of New South Wales, Meredith Woolnough specialised in embroidery during her fourth-year honours course. It was during this year that she developed her special technique for producing her innovative embroidery designs. Meredith's process involves drawing with a domestic sewing machine onto a water-soluble base fabric. After the embroidery is completed she dissolves away the base fabric to leave the bare threads behind. In this way, she transformed a run-of-the mill sewing machine into an unconventional drawing tool, allowing her to create unique pieces of embroidery art with a balanced richness of texture and colour. Her graceful, stylish embroidery traceries capture the beauty and fragility of nature in knotted embroidery threads. Her aim is to create embroidery sculptures inspired by natural forms. By repeatedly stitching threads into dense structures Meredith creates intricate, complex openwork compositions that are subsequently suspended in space with pins, casting delicately dynamic shadows. One special theme Meredith feels attracted to is the Ginkgo tree, the leaves of which form the basis for many of her compositions (see photo above). The Ginkgo tree or Ginkgo biloba is native to China, and is regarded as a sacred tree in China and Japan. One of its most striking features is its fan-shaped leaves. "It's an amazing plant, very fascinating," says Meredith, "It is one of the oldest plants in the world and it has remained practically unchanged for millions of years. I am particularly interested in the structure of its leaves, which are unlike those of most other plants, and in the way it grows. Some of the Ginkgo leaves I make are multi-layered. I find them a great inspiration for my work." One of the underwater creatures Meredith uses as a model for her art is the Nautilus, a mollusc typically found in the sea at relatively great depths in the Indo-Pacific region, whose shell has a beautiful spiral shape. "The Nautilus is not a creature you find in coral reefs," explains Meredith. "It actually lives in much deeper waters. I have used the spiral pattern of the Nautilus shell, which has some very interesting orange blends of colour, as a motif for quite a few of my creations." "I have never photographed a Nautilus in the wild, but I have taken photographs of other living underwater animals. I haven't found the right way to use these in my work yet - perhaps one day. At the moment I am more interested in static forms." Meredith also has a Master's degree in teaching and taught visual arts, textiles and design in secondary schools for several years. She currently works as a full-time artist and is no longer doing teaching work besides workshops in her embroidery technique. Meredith shows her work in at least two or three Australian exhibitions each year, but hopes to be able to attract a more international audience in the near future. 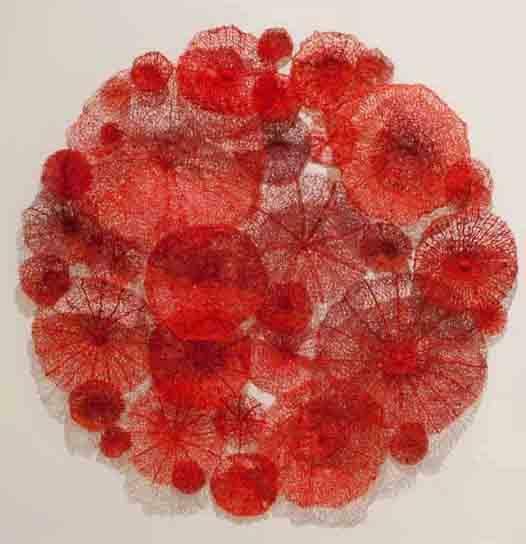 Giant red coral branch, embroidery thread, pins and glass rods on Fabriano paper. Meredith explains how she produces her embroidery art in somewhat greater detail. "First of all I draw the design onto a special water-soluble fabric. This fabric was originally developed fr use as a dissolvable landry bag in the medical industry, but I am using it as the base fabric for my work. I can only work on a small section of the embroidery at the time, because the embroidery hoop I use is quite small so by sketching the design on the fabric first I don't lose my way. As in most embroidery work I use an embroidery hoop to keep the fabric flat, so I can safely guide the fabric through the sewing machine." " My machine is a normal sewing machine like many people have, but I have set it up in such a way that I can draw with it. Normally a sewing machine will pull the fabric through and direct where your stitches go, because most of the time you want to sew a straight line - if you are dressmaking, for example. But I need to be able to completely control the stitches to follow the lines of my design. I usually go over each line several times so that the final result is a big piece of thick, connected embroidery." Once the embroidery work has been completed as described above, Meredith dissolves the base fabric in water and mounts the resulting artwork on a piece of paper or on a wall. "When I stitch I have to make sure that the piece is very dense and the embroidery is all connected like a big spider's web. You need to make sure it really is all connected before you dissolve away the base fabric, otherwise it will fall apart." Meredith doesn't paint her designs: the rich coours arise from her use of different coloured thread. "I use different combinations of colours that blend seamlessly, so that the final result is just as if I were painting with thread." One of the themes Meredith Woolnough has used in her art work is the Mandala, a spiritual symbol of the universe widely encountered in Hinduism and Buddhism. Meredith has created a special Mandala series, a sample of which is shown in the photo on the right. The basic form of most mandalas is a square with four "gates", each one containing a circle with a centre point. "I have always been fascinated by mandalas," enthuses Meredith, "and the process of sewing is almost a form of meditation for me. I find sewing very relaxing: it is extremely repetitive, and quite like the process used in making traditional mandalas. Besides, the embroidery hoop I use in my work has the same circular shape as a mandala, while the complex designs I tend to use are not unlike those found in a mandala." 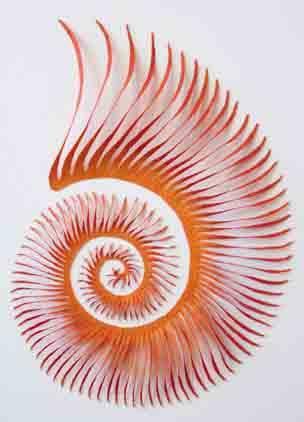 Detail of Red Nautilus - an embroidered artwork inspired by the Nautilus shell.